The most comfortable shoes I bought in the past years (not considering these ones). Plus, they are the cutest shoes, when I wore them the first time I walked almost 15km around London and not even one blister! For a girl who always has trouble with shoes, this is amazing and makes me want to grab the other colors. I believe they are sold out online (I ordered mines here) and I’m not surprised. They are part of the “Premium Quality” H&M range and they are made of a soft pink suede. Extra kudos for coolness and comfort for the soft heel cap which can turn into slip-ons – a big trend this season! Stay tuned because I believe I will be wearing them all the time! Os sapatos mais confortáveis que eu comprei nos últimos anos (se não incluirmos estes). Honestamente, além de serem uns sapatos lindos e muito versáteis, quando os estrei andei quase 15 km por Londres e nem sequer uma bolha me fizeram! Para alguém que tem sempre problemas com sapatos, isto é incrível e desperta o meu desejo consumista de querer comprar as outras cores. 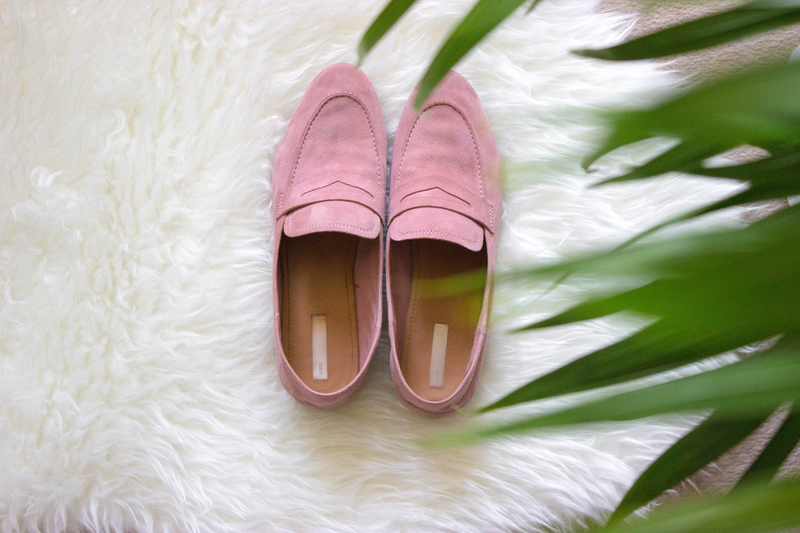 Estes loafers fazem parte da gama “Premium Quality” da H&M sendo produzidos em camurça rosa clara. Um ponto extra de conforto e coolness, é o calcanhar macio que podem facilmente calcar para torná-los nunsslip-ons – uma grande tendência nesta temporada! Fiquem atentas porque eu acredito que vou usá-los o tempo todo! You must be <a href="https://ararapintada.com/wp-login.php?redirect_to=https%3A%2F%2Fararapintada.com%2F2017%2F04%2Fpink-loafers-new-in%2F">logged in</a> to post a comment.